Blogging from a teachers perspective and from a students perspective. I am working closely with a number of teachers on blogging in the classroom and how they might embrace this communication technology. There has naturally been some who have embraced the platform while others have initially shown some resistance as they have struggled with both the mechanics of building in a digital space, but more so their uncomfortableness with communicating in this space. Many teachers still feel nervous about being “on show”. There is also the prevailing view from our generation of the “large consequences” of voicing things in the online space. I’m not sure how true that view is. I have also been working on a term long unit of work with my friend and fellow educator Dan Donahoo. We were working with a group of 30 children aged 11 and the contrasting opinions and use of the digital world has been quite enlightening. The focus of our unit is on game making and it is an exciting and totally engaging unit for these kids. 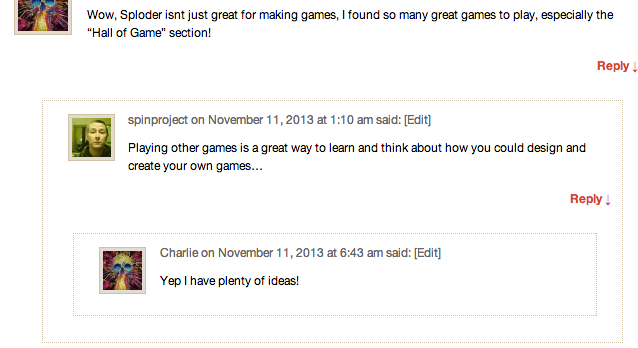 At the start of the project I quickly built the students a blog to help us communicate with them. As we are only with this class for one hour a week I was looking for a space where they could potentially become involved with the project outside of the classroom and beyond our physical contact hours. Dan and I gave them no instruction on how to use a blog or what we expected of them in this space. Rather we simply gave them the URL and said it was available to them if they wanted to use it. The subsequent 6 weeks and the way the blog was used by the students was incredibly informative on this generations ability to communicate in the online space. But beyond that it was quite interesting to note the reasons for their communication how it relates to learning how it is quite different to some of our more traditional practices. Allow me to give a few examples. The first night there were 19 comments – this is a class of 25 and shows the ease of which they use this medium. There was little to no evidence of fear of leaving a comment an opinion or asking a question. There was no feeling of “permanency” of their digital imprints leading to a fear of learning from the environment. Something I think we need to consider in our current approaches to “cyber safety”. Maybe its time to stop condemning the young for permanent records of their youth and inexperience. Maybe it is time to embrace a different perspective. You can note in the picture below that opinion of our class is given (thankfully positive) and information about the subject is freely offered up helping us as educators to get t know our students better. Secondly, Dan and I decided to upload a vague plan of where we were heading in the unit – a unit outline. A number of students had read all of the planned work and jumped ahead and started to work at the place they were ready and excited to work at. They were rejecting our linear strategies and rather learning at the point of there own readiness. This really best represents how learning works – it is never linear. Perhaps some of the students had already covered our initial work in other classes or other parts of their life and didn’t require that from our plan. Excellent. Our idea of putting up the whole course content was also to encourage immersion into the work. Potentially there would be kids who would so take to this subject that they would like to do it in their own time, to be limited to our system of learning which only involved the one class a week at 2.30 on a Monday afternoon. Thankfully this did prove to be the case and it allowed for us as educators to stretch out and notice how it is important for our planning to be very flexible and dynamic. Kids were moving in directions beyond our planning and we needed to allow for that rather than constrict them to or initial limitations. 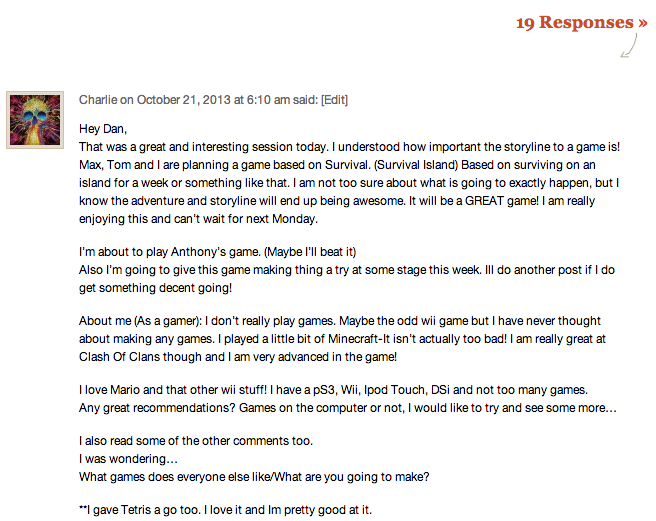 Finally the blog was a great place for the children to extend each other and provide each other feedback beyond the ability of Dan and myself to do that. They would upload the games they were making and respond with critique both positive and negative to each others work, they would ask for immediate help and get quick responses rather than waiting for Dan or myself to be the sole assisters in their learning. Below Charlie expresses something he has learnt from his own investigations with the group allowing response from Dan and suggestions on how to move forward. The following clip shows evidence of students uploading incomplete work, not afraid of public condemnation of poor work, rather they are uploading it to generate learning – they are looking for advice and subsequently got it from other students, myself and Dan. One final thing of note, that will hopefully encourage many nervous teachers to jump in. While being one of the main educators involved in a game-making unit I have never created a game in any of the platforms the students chose to create in. I have used many others but not these ones. As a teacher you don’t need to be an expert in software – you need to be able to set up learning environments that allow for a degree of student empowerment allowing you to manage the environment and push the students to go deeper in their inquiries.